Back in high school, I remember a popular game called "Seven-minutes in heaven," where a boy and a girl go off alone somewhere and...do whatever. Trump and Putin had two-hours in heaven yesterday, where they groped each other, and talked about everything except election meddling and Russia's invasion of the Ukraine. What did they talk about? That's the question the world wants to know. Putin - "Come to Daddy's arms my little babushka! It's been too long." Trump - "Daddy! I have so much to report." Putin - "Take your time Donny. I'm listening." Trump - "Our plan to destroy NATO is moving along great. You should have seen the faces of those world leaders when I dressed them down in Brussels! It was magnificent!" Putin - "Good work my Donny boy. You're making me proud." Trump - "How about when I called it a "witch hunt" before and after Rosenstein announced 12 Russians were indicted in the Mueller investigation?" Putin - "I love the way you're sticking to the plan. We have so much more to accomplish yet. Maybe someday I'll give you the "Pee-Pee" tapes when you make America a satellite of Russia." Trump - I love it when you talk tough." Putin - "Now what are we going to say during the upcoming public meeting? Trump - "That we talked about election meddling, Hillary Clinton's emails, the DNC server, and how you are as credible as our collective intelligence agencies." 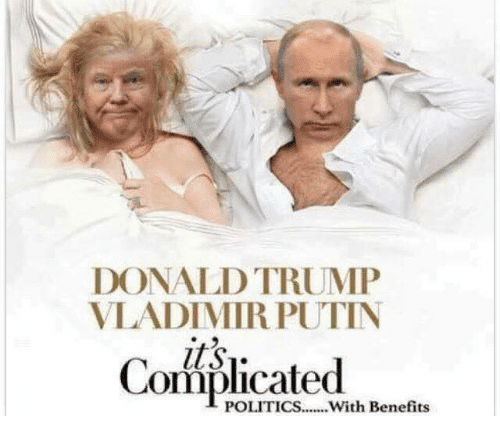 Putin - Very good Donny! Remember to try and sound sincere. Especially the part where you accept my denials of interfering with the 2016 election. Trump - "I'll do my best. How about my reward?" Putin drops his trousers. "Come and get it, good boy!"